The dichotomy in the political approach of the Samajwadi Party (SP) is glaring. On one hand it continues to support the UPA government from the outside and on the other it vehemently opposes the decision to allow FDI in multi-brand retailing. A day after his meeting with Mulayam Singh Yadav created a buzz about the Third Front revival, Punjab Deputy CM and SAD chief Sukhbir Singh Badal on Sunday came face-to-face with another champion of such a formation, CPM�s Sitaram Yechury. The Haryana Government has effected a third hike in power tariff within a span of five months. The power tariff hike ranging from 17 paise to 45 paise per unit, which has come close on the heels of a power hike on April 1 and July 1 in the current financial year, has come into effect on account of recovery of fuel surcharge assessment (FSA) with effect from September 1. 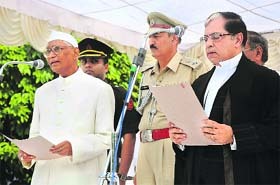 �Justice hurried is justice buried�, said Justice Arjan Kumar Sikri soon after taking over as the 31st Chief Justice of the Punjab and Haryana High Court this afternoon. An armyman was killed and two others injured in an accidental blast caused reportedly while handling explosives at 8 Grenadiers barrack in Kapurthala on Sunday. 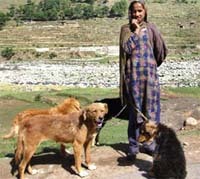 The famous shepherd dog species of Kashmir - Bakerwali - is facing threat of extinction. The Gujjar-Bakerwal tribes have been using this rugged breed of canines to protect their livestock from wild animals since centuries.